In 2001 the search engine GoTo was renamed Overture. 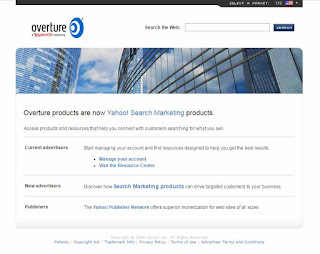 Overture was especially known as the first successful search engine with pay-for-placement service. Since 2000, Overture has delivered this service very successfully to other providers such as Alltheweb, AltaVista, Yahoo, MSN and other portals, search engines and websites. 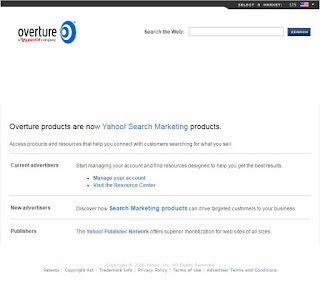 Overture used Goto.com's search technology (the crawler), which was based on the World Wide Web Worm (WWWW) search engine purchased from Goto.com. In 2003 Overture bought Alta Vista and AllTheWeb, and in the same year Overture was bought by Yahoo. In 2007 Overture was closed. 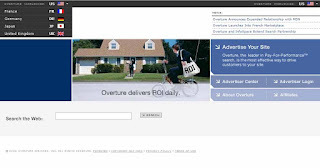 2001 - 2003 Overture Services, Inc.
»Overture changed its name from GoTo on October 8, 2001. "Overture is an introduction, and we feel that's what we do as a company," said GoTo's chief operating officer Jaynie Studenmund at the time. "We also felt it was a sophisticated enough name, in case our products expand," a telling hint of the acquisitions of AlltheWeb and AltaVista in 2003.